If you have added multiple brands, you can create one or more Help Centers, depending on your Support and Guide plans. A brand's Help Center is completely separate from any other brand's Help Center, if you have multiple. End users who visit the Help Center for a specific brand see tickets for only that brand. If you're using ticket forms, all ticket forms will be available in all of your Help Centers, if you have multiple. Click the Admin icon ( ) in the sidebar, then select Manage > Brands. If you haven't already done so, click Add brand to add your brand (see Adding multiple brands). On the Brands management page, click the menu icon beside the brand you want to set up a Help Center for, then select Edit. Under Help Center, click Create. Select a theme or click Skip for now. When finished, you'll see confirmation that your new Help Center has been created. To access a branded Help Center, see Viewing a Help Center for one of your brands. When you have multiple Help Centers to support multiple brands, you cannot restirct users to a specific Help Center. All of your Help Centers are accessible to all of your end-users. If you are using remote authentication or SSO, each Help Center will redirect users to the same single sign-in protocol and database. This is because users belong to the account, not to a specific brand. When users receive a welcome email, password reset email, or identity verification email, it will include a list of all of your Help Centers. This ensures that users understand that any changes to their account affect their access to these multiple Help Centers. If you accidently created a help center from one of your brands. How do you delete it? Is that possible to create multiple Help Centers for one Brand? Thanks for your question. You can only create one Help Center for each Brand that you have set up. We are going through a re-branding process and will need to maintain two-brands for a short period of time. Can I duplicate my current knowledge-base and just change the brand hosting and design? The only way to duplicate your current Knowledge Base would be to export everything from your current one, and then import into the new one - unfortunately there's no magic button that will duplicate it all for you. Best of luck with the rebrand, though! Those are always exciting times. I am currently on Essential plan and want to maintain separate set of FAQs for each product. Is it possible? If yes, then how do I achieve that? Hi Sandeep! Welcome to the Community! Have you put the Web Widgets in your Help Center, or in a different website? If you're using Help Center, are you on Lite or Professional? Hi Jessie! I'm glad to join the community! Yes, I have put the Web Widget in the Help Centre as well as in my various websites. I am using Help Centre Lite. Hey Sandeep! Thanks for clarifying! If you're using our Multibrand feature, you get a separate web widget for each brand that will allow you to do what you're describing here. You can find out more about that here. Allright, I will go through the details here. Thank you for your help Jessie! "Support Enterprise and Guide Lite or Professional: Five brands, one Help Center"
What exactly would the setup of this look like? I'm trying to figure out, if we have 5 brands and 1 Help Center, does that mean the brands still have sub-domains but they just share a community, tickets, etc.? We would like to have multiple brands, but we want our users to be able to search for all information from each brand within 1 widget and from one main Help Center, so we are trying to figure out the best way to achieve this. If you're using Support Enterprise, you can set up up to five different brands to route customer tickets. This applies regardless of what Guide plan you're using. If you opt for Guide Lite or Professional, you'll get one Help Center to support your customers regardless of brand. There are no additional levels of content organization or sub-domains or anything; just one Help Center where you can create content for all of your brands. It sounds like that's exactly what you want to do! Let me know if you have any more questions! I don't see an option to create a Help Center for my 2nd brand. We are Support Enterprise and Guide Legacy. Do we need to upgrade Guide / pay more? Thanks for your question. Yes, you would need to upgrade to one of the current Guide plans in order to create an additional Help Center. Your plan allows for up to 5 brands in Support, but only one Help Center. I can't find field "Help Center" and create one under "Host Mapping" field. Why? Hi, I simply want to add my support for granular control of end-user access to Help Centers with multiple brands. My aim is to grant professional tier end-users access to a special Help Center, and grant VIP tier end-users access to their own special Help Center. I am also interested in different sign-on protocols for different end-users (e.g. SSO for professional only). I'm having to rethink strategy. Is this capability in the pipeline? If I have sensitive content, I guess my only option now to hide sensitive content is to limit access by user segment? So, a "regular" user could access a VIP Help Center, but couldn't read any content (if they were not in the VIP user segment). Am I thinking correctly? So that I can get a bit more information from you regarding your request, I'm going to reach out to you via a ticket. You'll hear from me in a few! "Removed restricted keys ["brand.has_help_center"] from parameters according to whitelist"
In the Brands API documentation it states that "has_help_center" is not a read-only variable, how come I cannot change it, being the admin of the new brand? We are on the Enterprise plan. We started with one brand, created a Help Center. Now we're adding a brand and want to use the exact same content for its help center as with the previous brand. If I create a DNS entry for the new brand and make it resolve to the first HC, I will have an SSL cert issue as it's valid for the first domain. How can we accomplish what we want? 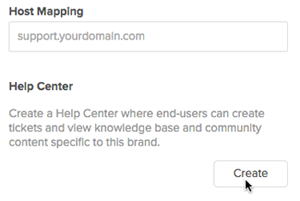 If you have separate subdomains (on your own website) for each brand, and you wish to map both to your Help Center, then, unfortunately, that is not possible. You may only map one domain to a single Help Center. The only possible option if you want two of your own (sub)domains to be linked to one Help Center, or in this case, to virtually identical Help Centers is for you to create a separate Help Center for your new brand (if you purchased Guide Enterprise, or the Multibrand add-on), with the same content as your current knowledge base, and set up host mapping for the brand. Sorry if the options are kind of limited. But, I hope this helps. Thanks Eric! Help centres with two different brands is a horrible solution. The fact that SSO is under the account rather than the brand pretty much makes the whole thing useless unless you have no need for authentication or restricted content within your help centres. Severely disappointed with this haphazard solution from Zendesk. Bulent's post reminded me to post a solution here. This is ugly and with a nasty visual effect of flickering a bit during the redirect. We actually have two different products, so the contents are completely different. One of the HC's has restricted content, whereas the other one doesn't have any. The first one uses SSO to log users in to the HC where they can view content depending on their access levels and also raised tickets etc. The second one isn't going to be able to do any of that due to the fact that the SSO is tied to the account rather than the brand. The only way is to set up a re-director but just feels like a lot of work for something that would be so much easier if we could have different SSO for different brands. Yes, it would be great to have different SSO options for different brands. Our Guide subscription allows for multiple Help Centers. We currently have 2 brands but we would like to have the help center content and user activities for both brands in one place. Has anyone found a workaround for this? We are at a place where we could move to a single brand but having 2 brands is better from a reporting standpoint. Can you tell me more about how your reporting is set up that having two brands is better for you? I'm wondering if we can figure out a way for you to shift to a single brand but use some other functionality to get the reporting you're looking for.